On all other iPhone models, you go to "Battery" in the Settings app and toggle on "Battery Percentage" in order to see the exact amount of power left in the status bar. On the iPhone X, XS, XS Max, and XR, however, that option no longer exists since there's not enough room up there to show the percentage indicator because of the notch for the TrueDepth camera system. But that doesn't mean it's gone entirely. There is no setting to enable to view the battery percentage indicator on your iPhone X, XS, XS Max, or XR because it's already activated, hiding in the Control Center panel. So while you will never be able to just glance at your iPhone again to see exactly how much battery power is left until it automatically shuts down, you can still perform a simple swipe gesture to see it — no matter what screen you're on. If you don't already know how to access the Control Center panel, you just swipe down with one finger from the top-right corner of the display where the battery icon and signal strength indicators are. If you don't want to actually use the Control Center, you could just swipe down to see the percentage left, then back up real quick without lifting your finger. Swiping down (left) vs. swiping down and back up quickly (right). 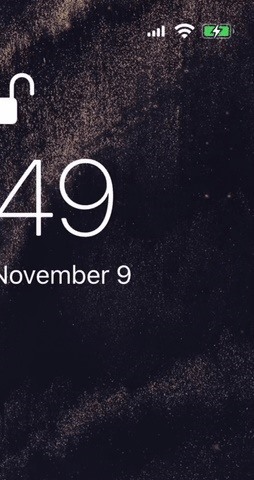 For some reason, Apple jumps the signal strength indicators over the left instead of keeping them where they are, which can be a little jarring, but it's to make room for the battery percentage icon, as well as other status bar icons like Bluetooth and Location Services. There is plenty of space under the battery icon.